White-fronted geese have migrated quite intensely during a couple of days. As a rule they won’t stay on our shore meadows during the autumn migration and even the passing migration only lasts – depending on weather – up to a week. Migrants are a couple of hundred thousands. The white patch at the base of the beak is striking and distinguishes them from other geese when they move in mixed flocks with for instance bean geese. The blaze is quite large and reaches from the base of the beak to the forehead. 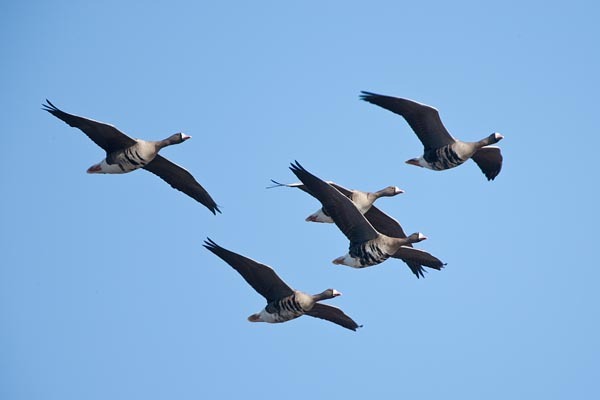 In flight the adult birds are noticeable by the dark patches on the belly. The beak is pink as that of greylag geese and the legs orange as those of bean geese. 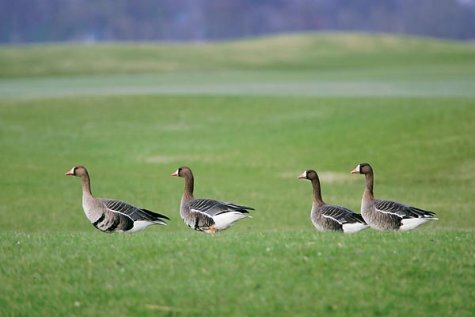 Compared to other geese the calls of white-fronted geese are more melodic and clearly more high-pitched – it is clearly discernible. The lesser white-fronted geese are only mentioned here as a species. Ornithologists count only some tens of them during the autumn migration. More observations of bean geese will come this week. Their migration is only starting. The white-fronted goose photos are from spring but the species characteristics are very well visible.